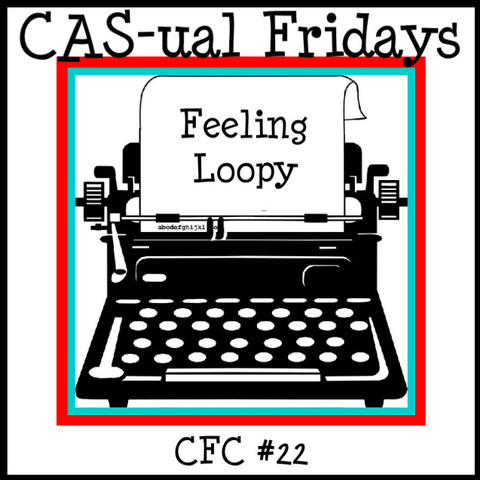 This weeks CAS-ual Fridays Challenge is called "Feeling Loopy": Use ribbon tabs or loops on your CAS creation! Fun right? 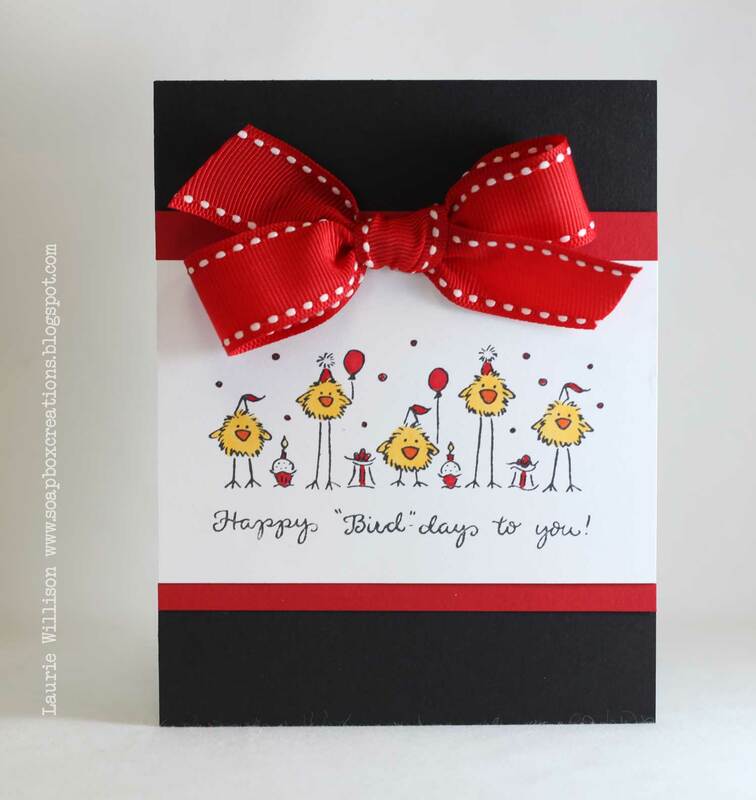 I have some super cute ribbon from our sponsor Ribbon Carousel on my card today! So glad you could come by today! Check out the prize over at the CAS-ual Fridays blog! Can't wait to see your loopy creations! I thought this card would be great for a guy type card. A basketball congrats or school or just about anything! Super simple with white on white and a little Copic for some color! I added a piece of twine I colored black to mimic the shoe string! Check out the Alpha Varsity set HERE! And stay tuned for Saturday! It's World Card Making day and let me tell you....Clear and Simple has a new set or 2 you WON'T want to miss! I masked the pumpkins so they could "sit" by each other! Then I added some Copic "dots" all around for the ground. I matted the image with black cardstock and then attached that with foam tape to the impressed card base! I know that Dana is shocked right now that I used orange AGAIN! She is so good at using this color! It's really growing on me!! I love the bright color! So in my last post, I told you about my trip...which was to happen this week....its a no go now! My kiddos are sick! I decided there is no way I am going to bring the sickies over to my little niece! I am pretty bummed because I have been planning this trip forever! And I was so missing my little sister! BUT we are going to go again in November so I am going to be patient! AND I am going to miss out on a little Archivers trip with Laura, Michele, Lisa and Tenia! I was really looking forward to meeting you all! I can't wait to get together with you all next time! Hope you all have a great day! Thank so much for coming by! Look closely and there are so many directions to go in! You can choose to focus on the colors, the stripes, or the repetition. I love these multicolored stripes! I cut lots of 1/2" strips and went to town! This uses more of those same strips! I ATG'd them all to the card base and then used Versamark to stamp the Turning a New Leaf image on the face. I had to throw a boy card in the mix! I thought the stripes were perfect for a little blast off! 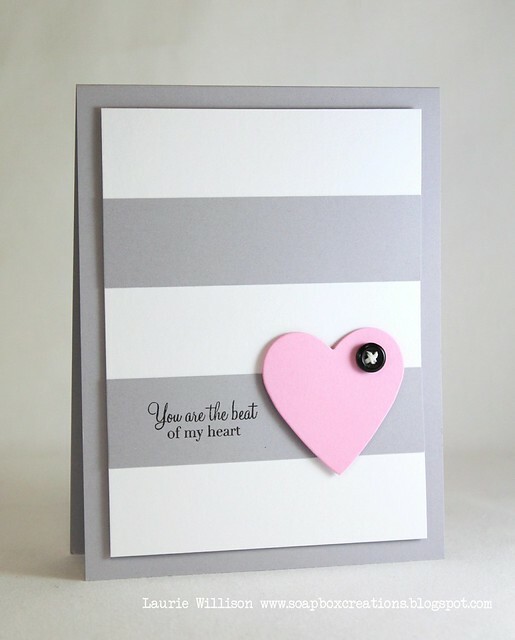 All of the cards use PTI's Pure Poppy, Aqua Mist, True Black and Stampers Select White! I love this color combo!! Go over and check out Nichole's blog for a full list of blog hop links! I can't wait to see all the striped cards and projects! I have been MIA lately as I just got back from a trip to KC! I got to meet up with Amy and Jinny, and we got to meet Lynn for the first time! We had a blast just talking and laughing about this amazing hobby we all have in common! We did spend a little time eating Cheesecake too, at the Cheesecake Factory on the Plaza! Yummo!! I have pictures to share but I don't have much time....soon to be on my way out the door again! I have another trip this week! This time I get to meet Michele, Laura, Lisa and Tenia at Archivers for some inky fun! I can't wait!! AND the real reason for my trip is to meet my brand new niece, Henley!! I can't wait to get on the road! Thank you for coming by today! When I get back, I want to get all caught up with my blog friends and see what you have been up to! Have a great Sunday! Hi everyone! I am back today with my last challenge as Guest Designer for Wee Memories! It has been a lot of fun and I am still so excited that they invited me along for the month! This weeks challenge is Patterned Paper Creations! This paper is from an 6x6 Echo Park paper pack! I love this pack so much! The colors are so bright and the patterns are so fun together! Echo Park is also the sponsor for this weeks Wee Memories challenge! Check back to the Wee Memories blog for more info on the challenge and to see more about this weeks prize! Thanks for stopping! And a huge thank you to the girls at Wee Memories for having me!! Mostly Monochromatic 3 + 1 Create a CAS project using at least 3 monochromatic shades of the color of your choice Plus chocolate brown. SO, stop over to the CAS-ual Fridays blog and check out all of the Monochromatic creations! I know there will be lots of eye candy for you to check out! Our sponsor this week, Stampotique, sent us some super cute stamps! I will have a creation to share soon using the stamps they sent to me! Here is a link to their store to check out all the amazing images they have to offer! Thanks for coming by today! I will be back soon with my last post as September Guest Designer for Wee Memories! Have a great Friday! I am so excited to be a part of this little blog hop to celebrate Nami's birthday! Several of us are getting together to bring some birthday cheer her way! If you are following the hop from the beginning, you got here from Dana's blog! You can always go back the DeNami blog for the full list of participants! Here is my birthday card for Nami! I used one stamp for this whole card! I had to use these little chickies just for her! Aren't they adorable? You have until September 23, 2011, 11:59 pm PST, to leave comments on all the blogs (to be eligible for a prize). There are lots of fun little goodies in that set! I am the last stop on the hop so you are all done! Click HERE to go back and leave Nami birthday wishes! Thank you all for coming by! Have a great day! Happy, happy birthday Nami! Hope your day is fantastic!! I lined up those letters to make my sentiment, and then stamped away! I thought it was kinda fun to add color to one line with a Copic maker. I stamped the bat from the "Baseball" set after running the Kraft cardstock through with a woodgrain impression plate. Easy peasy! Check out the whole Alpha Varsity set HERE! I am thinking this is going to make some super cute T-Ball scrapbook pages! I really need to get some pictures out and get to it! I am so behind on my pages!! So the next couple weeks are going to be insane for me starting with a salad supper at church tomorrow night! I got my table decorated last night so that is ready to go! I have to make a couple salads to take along! (If you have followed my blog for awhile, you may remember my first Salad supper table! I blogged about it HERE! That was a FUN table to make! Lots of paper-crafting going on there!) We have an awesome speaker this year and I can't wait to hear what she has to say! Her speech is "Weird but Fabulous! "....I am so intrigued by that! I can't wait to hear what she has to share! I also have 2 trips coming up in the next 2 weeks! I am off to Colorado next week to see my sister in Colorado! So much to do and so little time! I hope you are all having a great week so far! I hope to come back to normal and catch up with you all soon! I have some super fun stuff in the works for Clear and Simple! 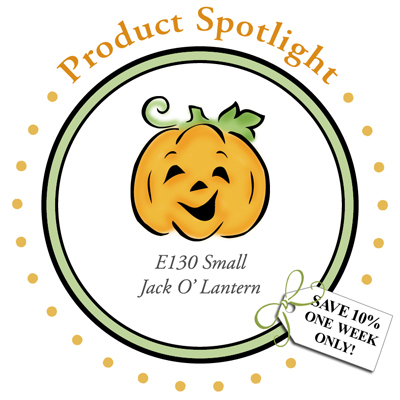 You won't want to miss the new release for October! And I have a super fun guest spot for October too! Thanks so much for stopping by!! I did a little masking with a rectangle Nestie for the text in the background. I ran that 4" x 5 1/4" piece of white cardstock through the Big Shot twice with the Linen impression plate....sorry for those of you who are tired of hearing about that IP....I can't not use it! Then I attached that to the card base with foam tape. I added a little banner sentiment with some more foam tape. Last is that butterfly! I colored the image with 2 shades of Copic markers and cut it out. I took a black marker and colored the edges so you couldn't see any white showing through. I think it looks finished this way! Then I added some black scrappers floss for the antenna and some silver pearls! I love this white on white look! So CAS! Check out the Wee Memories blog for more details on this weeks sponsor and the prize! That's it for today! Off to enjoy this gorgeous day! See you soon! TGIF, right? It has been a pretty fun week here, as the Kansas State Fair has been going on! I have had my fair share of food that is terrible for you and terribly yummy! That being said....my husband and I are going to go back ONE more time...with no kiddos! My last bad-for-me-food? An apple dumpling! Yay!! I told the sitter today, we are going back to see the boring stuff the kids don't want to see which includes NO midway!! I won't step foot back there till next year! And they won't even know they are missing out on Apple dumplings! OK, so on to today's CAS-ual Fridays challenge! Mini cards!! Check out Annabelle stamps HERE and click HERE to go see this week's CAS-ual Friday prize! So glad you all came by today! Have a great day! So, awhile back I thought I would try the new Blogger interface. I really like it! It just looks better and has so many new features that I love. I had figured out that the scheduling part didn't work so well because the time would never show up correctly and then I assumed later it was fixed. WELL. not so much! The post that posted at 12:01am was a scheduled for another day. And this post was scheduled for this morning. That one posted. This one didn't. Lovely. SO, again I am posting 2 times in one day! Sorry! I added the ledger lines with a ruler and a black pen. Then I stamped the apple and then added the paper piecing and a little white gel pen for some shine! The "you're special" is from one of my favorite Petit Fours from DeNami, Thoughtful Greetings. 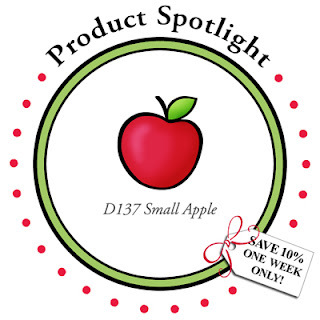 There are a bunch of adorable apple cards over at the DeNami blog today! Go check them out! Again, I am sorry for the double post! Have you tried the new blogger interface yet? What are your thoughts? Just flopped one upside down and added a heart! Can you see that texture in the background? Love it! I think this card is kinda fun! Well, I am super tired! This will be a short and sweet post! I really should get to bed! Hope you are all having a great day! Hey everyone! I am here today with the Clear and Simple Group Project! Our challenge...Have fun with letters. Pick a letter in the alphabet to inspire you. My letter is R! Just as the photo above....R for Red, Rainbow and Rylee! I made this card using 3 CSS sets! The rainbow is made from the line stamp out of Tweet Notes! I just stamped the line 5 times and then colored with Copics to create a rainbow! The "Happy Birthday" is from the set, A guy thing! And then I spelled out Rylee using the stamp of the month for September, Alpha Varsity! I colored in each letter with a red Copic. I added a little button, some twine and a cloud for a little more detail! Stop by the rest of the DT girls and check out their Alphabet creations too! Don't forget to stop by the CSS blog too! Hope you have a great day! Hey everyone! I hope you are having a great Sunday! We are playing inside today as I have a sick little one and some warmer temps outside! I thought I would sit down while the kids were watching a movie and make a quick challenge card! I picked the Stripes Color Trends Challenge! I love the color combo!! I cut 3/4" strips of Pure Poppy, Ocean Tides and True black cardstock and attached them to a piece of kraft cardstock. Then I ran that panel through my big shot with the Linen Impression Plate. I cut a hole using a Circle Nestie. After centering that on my kraft base, I traced the circle lightly with pencil and then stamped the compass inside. I attached the twine and tag to the panel and then adhered it to the card base with foam tape. Super easy! Here is a closer shot of the texture! OH and the little silver pearl for some added detail! Here is the color combo if you'd like to play along too! Click HERE for the challenge and details! PS. Peter asked which woodgrain embossing folder I used for my HB card over on the Cards Challenge blog! That is the Woodgrain Impression plate from PTI! HTH! This is acutally a pretty big tag, complete with a pocket! I used DeNami's Espresso Scene stamp for a simple decoration on the front of the pocket. (Looks like its on sale right now too!) :) On the inside you can see I wrote out a note for my friend. Then on the back is this tasty little treat! Great for a thinking of you gift I think! I just punched a hole in the cocoa packet and attached it to the note with a bow! The next stop on the hop is DeNami's Guest Designer for the month, Emily Keaton! I know she will have a fun project to share! Stop back by the DeNami blog to see all the blog hop details! Just so you know they are giving away 2 gift certificates for $20 each for commenting along the hop! Thanks for coming by today! Have a great Sunday!